IMAGINE the late ’70s progressive jazz/rock boom of Jeff Beck, John McLaughlin and AllanHoldsworth, and you might be somewhere on the right track to the music of Anglo-American electric guitarist Mark Wingfield. Yet here is a musician who has honed his own, specific approach to the instrument and, consequently, his original, heavy-duty compositions. Recording for the first time with New York-based label MoonJune Records, Wingfield has partnered with two stalwarts of the current jazz/rock scene – bassist Yaron Stavi (David Gilmour, Phil Manzanera, Robert Wyatt) and drummer/percussionist Asaf Sirkis (Gilad Atzmon, Jeff Berlin, Tim Garland) – to forge an otherworldly vista of shifting, synthy textures and intense rock-outs. Mark Wingfield’s mercurial guitar technique, frequently at the highest extremity of the fretboard and coaxing extended pitch-bent effects from the tremolo arm, is what defines his signature sound, along with staggering rapidity of improvisation. Foreboding opener Mars Saffron is instantly redolent of the brilliance of, say, Gary Moore, Jan Hammer or Simon Phillips, as Wingfield’s searing melodies soar over hard-driving electric bass and drums, only pausing briefly amidst synthesised washes. Shadowy Restless Mountains, jangling to metallicised strings, finds Sirkis revelling in its space… at his flamboyant, fire-cracking best; and The Way to Etretat becomes delightfully acoustic as Stavi’s upright bass extemporisations dance around Italian-suggested ambiences, with Wingfield’s later guitar re-entry elevating the whole atmosphere to cinematic soundtrack status (again, Sirkis is irresistibly explosive at the kit). A mellower, Metheneyesque synth quality to Wingfield’s guitar is found in A Conversation We Had and A Thousand Faces, both offering Wingfield the freedom to elaborate with haunting lyricism. And energized, full-throttle Voltaic resounds to quickfire, rhythmic riffs and gritty, percussive, droned abstractness – echoing Keith Emerson’s roughhouse ELP extravagances, it’s quite a ride! Summer Night’s Story is an engaging episode of fluctuating colours, Sirkis’ refracting cymbal show especially catching the ear. 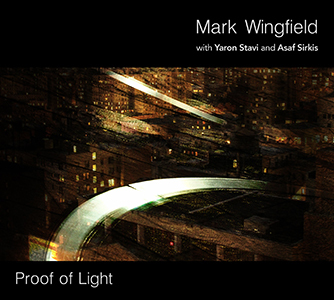 Koromo’s Tale seems to occupy a cathedral-like vastness, with oriental overtones, as Yaron Stavi’s double bass improvisations set up Wingfield’s own explorations; and title track Proof of Light closes the 54-minute sequence with Sirkis and Stavi supporting Mark Wingfield’s virtuosic, high-wire display before blazing white-hot at its conclusion. A cursory listen to this album might call for greater variation or augmentation of the trio’s elemental sound – but once immersed in the detail, Proof of Light becomes an intoxicating journey of drama and outstanding technicality. Further details and audio samples at MoonJune Records.